This richly drawn ethnography of Samburu cattle herders in northern Kenya examines the effects of an epochal shift in their basic diet-from a regimen of milk, meat, and blood to one of purchased agricultural products. 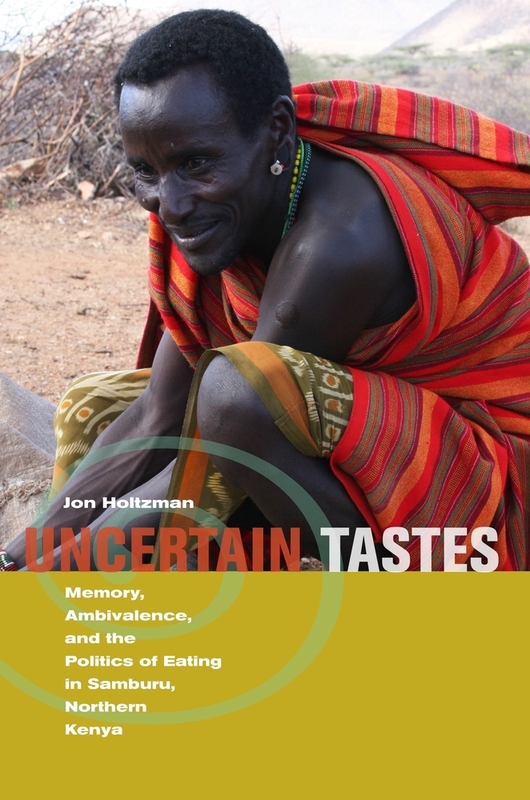 In his innovative analysis, Jon Holtzman uses food as a way to contextualize and measure the profound changes occurring in Samburu social and material life. He shows that if Samburu reaction to the new foods is primarily negative—they are referred to disparagingly as “gray food” and “government food”—it is also deeply ambivalent. For example, the Samburu attribute a host of social maladies to these dietary changes, including selfishness and moral decay. Yet because the new foods save lives during famines, the same individuals also talk of the triumph of reason over an antiquated culture and speak enthusiastically of a better life where there is less struggle to find food. Through detailed analysis of a range of food-centered arenas, Uncertain Tastes argues that the experience of food itself—symbolic, sensuous, social, and material-is intrinsically characterized by multiple and frequently conflicting layers. Jon Holtzman is Associate Professor of Anthropology at Western Michigan University and is the author of Nuer Journeys, Nuer Lives: Sudanese Refugees in Minnesota.